The DNR Forest Health Program has transitioned to a new online newsletter format. You will no longer receive Pest Updates and Regional Forest Health Newsletters directly from DNR Forest Health Specialists. Instead, if you are subscribed to Forest Health News you will receive an email, typically once per month, when new information is posted by the Forest Health Program on this new Wisconsin DNR Forestry News site. You can also access the articles directly anytime. If you haven’t already, consider subscribing and please take a moment now to include widnr@service.govdelivery.com in your email address book, so the emails avoid your spam box. Information specific to certain parts of the state. The Forest Health News zones have changed too, so check out which counties each zone covers. The map shows which counties are included in each Forest Health News zone for purposes of monthly news updates, as of March 2017. 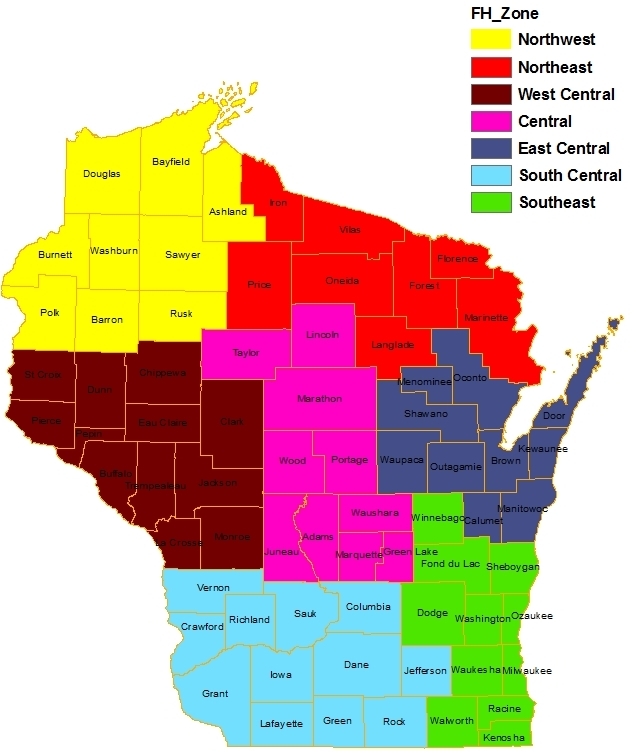 Subscribers to Forest Health News emails and visitors to this site who are interested in forest health articles for specific parts of the state can refer to the map to check out which forest health zone or region they’d like to read news updates from on this site. If you use tags from the menu bar on the right side of this page to sort articles remember: Forest Health News with statewide relevance is shown with a “Statewide Forest Health” tag and is not included in each zone’s tag. For more information: Colleen Robinson, forest health educator (Colleen.Robinson@Wisconsin.gov), 608-266-2172. Map of the known distribution of oak wilt in Wisconsin as of December 1, 2016. Oak wilt, a deadly fungal disease affecting red oaks, was confirmed for the first time in Price County in 2016. 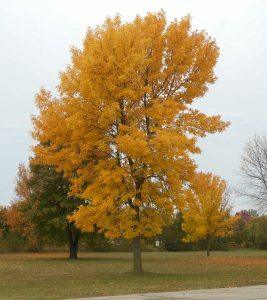 In addition to the new county find, the disease was also confirmed in various townships in northern Wisconsin counties where we already knew oak wilt was present. The map in the oak harvesting guidelines was updated based on the find. Oak wilt is commonly found in the southern two-thirds of the state, but has been creeping northward. The disease was found for the first time in 2010 in Oneida County, in 2012 in Lincoln, Sawyer, and Vilas counties, in 2013 in Rusk County, and in 2014 in Washburn County. 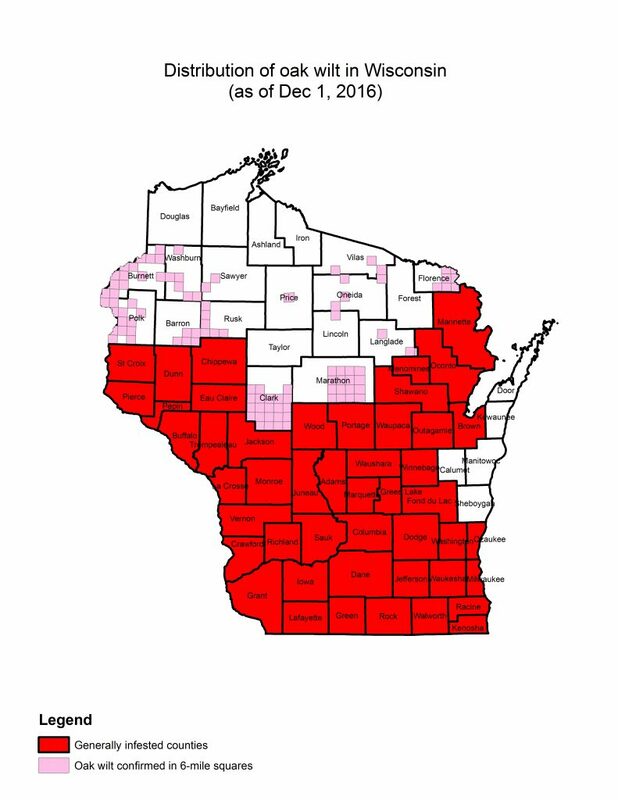 Oak wilt has been confirmed in all Wisconsin counties except Ashland, Bayfield, Calumet, Door, Douglas, Forest, Iron, Kewaunee, Manitowoc, Sheboygan, and Taylor. Read more about oak wilt prevention in the news release from March 21, 2017: Protect oak trees from oak wilt by waiting until after July to prune. 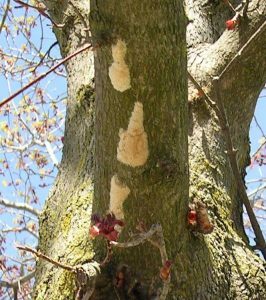 Homeowners who are interested in reducing gypsy moth caterpillar numbers this summer should consider oiling or removing reachable egg masses well before the eggs begin hatching in the second half of April. Gypsy moth egg masses are tan-colored lumps about the size of a nickel or quarter, and usually contain 500 to 1,000 eggs. The egg masses can be found on any rough or protected surface including trees, houses, firewood piles, bird houses and other outdoor objects. Do NOT scrape the egg masses onto the ground or step on them or break them apart. Many of the eggs will survive and still hatch. Releasing adult Spathius galinae for EAB biocontrol. 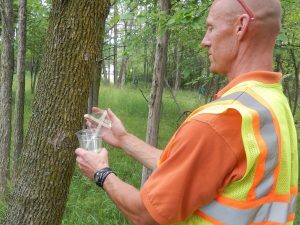 EAB biocontrol releases in Wisconsin will continue in 2017. Wisconsin first released parasitoids to help control emerald ash borer (Agrilus planipennis) in 2011. Our first releases in northeastern Wisconsin occurred in 2016 when we released the two larval parasitoids Tetrastichus planipennisi and Spathius galinae, as well as the egg parasitoid Oobius agrili. These parasitoids are incredibly small, but they find EAB larvae and eggs just fine, helping to reduce the population of EAB. These parasitoids will not stop EAB, but they are an additional tool we can use to slow the population growth. 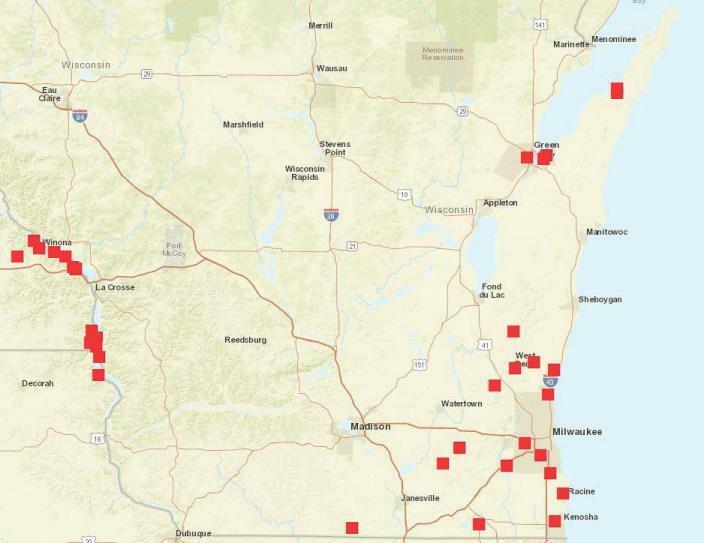 Locations in Wisconsin where EAB parasitoids have been released 2011-2016. Map created by Bill McNee. Written by: Linda Williams, forest health specialist, Green Bay (Linda.Williams@Wisconsin.gov), 920-662-5172.